With a release date of January 22, 2009, the United States Mint proudly introduced the 2009 Ultra High Relief Gold Coin. In a process that spanned more than 100 years, the mint took the original designs of Augustus Saint-Gaudens from the early 1900's, and utilized modern technology to create the Ultra High Relief result he had originally desired. 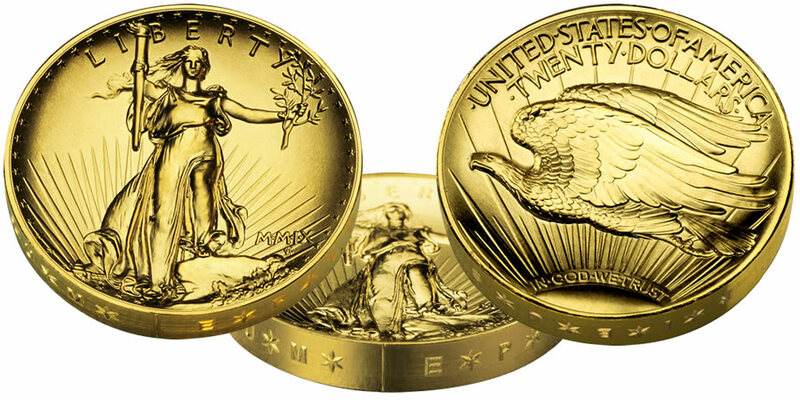 This Ultra High Relief coin is similar to the 1907 Double Eagle designed by Saint-Gaudens which is considered by many to be the most beautiful coin ever produced by the United States. However, technological limitations of the time did not allow the super detailed effect Saint-Gaudens had intended. The new 2009 coin more closely resembles his original plans. Changes to Saint-Gaudens original design include adding stars to bring the number up to 50 (one for each state) and the words "IN GOD WE TRUST" were inserted. A border was added for a more consistent edge, as well as the new year of 2009 is shown in roman numerals. Augustus Saint-Gaudens was born in Ireland in 1848, but his family immigrated to the United States when he was only six months old. The arts attracted his attention at an early age, and his training included apprenticeships, classes, as well as study abroad in Europe. Upon his return to the U.S., he became quite well known for his statues relating to the Civil War, many of which are still standing today. His additional interest in numismatics would serve him well when President Theodore Roosevelt chose him to help redesign the coinage of the country. They both felt that the coins of the United States needed to be beautiful to showcase to the world the countries' preeminence. However, he would only design the Indian Head $10 Eagle and the $20 Double Eagle gold pieces before his death (both were struck by the Mint from 1907 thru 1933). A statuesque Liberty adorns the obverse, striding powerfully, as she is leading the way with a torch in her front hand and an olive branch in her back hand. The United States Capitol dome can be seen in the background. "Liberty", "MMIX", and 50 stars (one for each state) are also shown. The reverse depicts a sunrise with a young eagle flying across it. The words "UNITED STATES OF AMERICA", "TWENTY DOLLARS" and "IN GOD WE TRUST" are also included. The motto "E PLURIBUS UNUM" is on the edge, with the letters separated by stars.